Success200 and F.L.A.G. 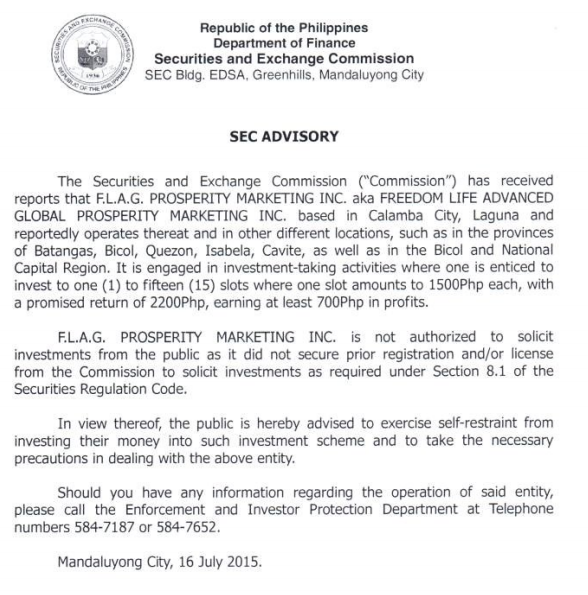 Prosperity Marketing are the latest Multi-Level Marketing (MLM) companies that the Securities and Exchange Commission (SEC) Philippines issued advisories on. I will not comment on whether these two companies are actually legitimate MLM companies or if they are pyramid/ Ponzi schemes disguised as MLM companies. You, as the reader/ investor should be able to learn how to distinguish between legitimate networking companies and pyramid scams. Here is Success200 official website (go here). Don’t just focus on what is written but on the impression that the company gives you. Also, do you think the website has enough information on what the company is all about? Here is Success200 official Facebook page (go here). Study and analyze the posts and the photos. Read the comments, although keep in mind that the comments are most likely moderated. The comments will also give you an insight on how the members think and feel. The timeline will also give you an idea how the company evolved and whether the company’s growth was reasonable. If the company is growing, where is the growth coming from? Here is an explanation of the Success200 compensation plan (go here). Study it and analyze what it will take for an investor to earn money. Freedom Life Alliance Global Marketing official website (go here). Do you think the website has enough information on what it’s all about? FLAG Prosperity Facebook page (go here) – I don’t know if this is the official FB page or if it is a specific team’s page since it doesn’t look like it has been updated for a while. As with the other company, study the photos and comments. Pay attention to the post dated March 25 since it listed the names of the company owners. One of those names was in the news recently. FLAG Prosperity Compensation Plan (go here) – Ask yourself if it is clear how you’ll earn money and where the money will actually come from? For other MLM companies that you have been invited to, planning to join or you’re a part of already, assuming that no SEC advisories have been issued yet, find out as much as possible about these companies. The easiest way is to make a quick Google search. If the names of the founders and officers of the company are known (if the company doesn’t disclose them, that is a red flag), do a quick web search about them also. Go to the SEC website and find out if the company is registered. A quick site search will also show if there are notices and advisories on them. A company that is SEC registered as a corporation doesn’t mean that it is registered and licensed to solicit investments from the public. Companies soliciting investments from the public (for investments, more than 19 people is considered public) should have quasi-banking licenses. 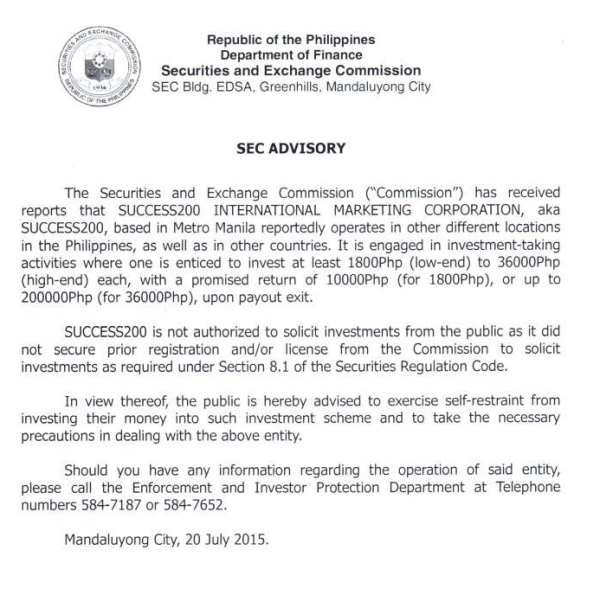 Beware that some companies that solicit investments but are not licensed by SEC to do so will label themselves as marketing companies. How will you know whether what you learned about a company points to legitimate network marketing or to a Ponzi scheme? This will be discussed more thoroughly in the next post. Even with the SEC advisories, why are the companies still being allowed to recruit?